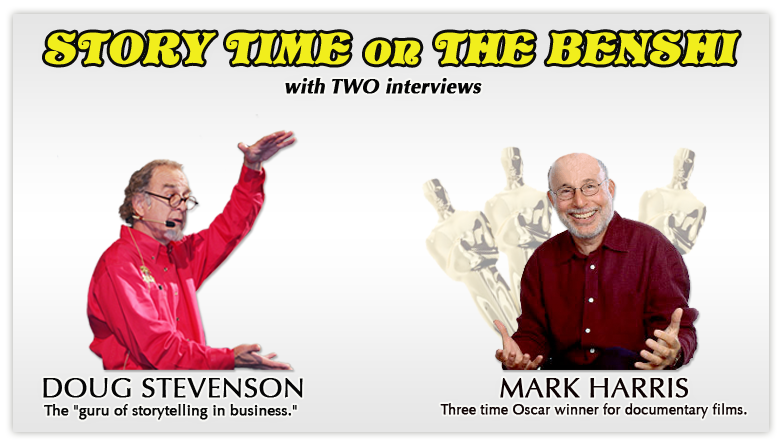 Last week I posted two interviews with professional storytellers Doug Stevenson and Mark Harris. Here I use the four chapters of my book to summarize their main points. When you’re a filmmaker you hear this question a lot — “So, like …um … what’s next for you?” I don’t blame people for asking it. I ask it of others as well. It’s sort of the easiest last ditch question when you’ve run out of everything else to ask, particularly when you’re wrapping up an interview. But I think it’s also at times reflective of a mindset that is part of the large scale problem with communication. It’s called “follow through,” and it doesn’t happen enough in our world. If you take a look at most major Hollywood filmmakers they are busy making two or three movies at the same time — cranking out product and usually being so busy with their newest movie that they have a hard time pulling their minds out of it to talk about the movie they shot last year which is just now being released. The result is limited “follow through” as movie after movie comes off the factory conveyor belt. In my book I talked about how the Pew Oceans Commission fell victim to this mentality — producing a three year study that was launched with a single press conference. Then the members of the commission moved on to basically “what’s next” with the assumption that the report would “speak for itself.” Which it didn’t. So here’s another element to go with this line of thought. In his brilliant book “Blink,” Malcolm Gladwell talked about the basic difference between intuition and analysis. He opens the book telling about how an art forgery detective can take one glance at a forged painting and instantly tell you it’s a fake. But if you ask why … well, he’s going to have to take a couple days to move the process from intuition to analysis as he slowly begins considering all the elements that make up the specific painter’s style. In the first chapter of my book I talked about the potentially powerful role of spontaneity in communication, which functions in the same way. The purpose of improv acting training is to get you, the actor, to act more quickly, more spontaneously, more intuitively. It causes things to happen for reasons you’re not quite certain why, and can take you a while to figure out if you should feel the need to explain why you did something. And so in the months, and even years, after the premiere of “Flock of Dodos,” I basically engaged in this same process. We made the movie very quickly. At the end of May, 2005 I read an article in the New Yorker about intelligent design. Eight months later we had a completely finished product and had our first public screening of the movie in Kansas. I did that on purpose — pushing and pushing to simply make the movie, rather than slowing down to get overly analytical. But the result was similar to the art forgery detective. I had a product that was full of decisions that were made at an intuitive level rather than analytical. The result of this was that the first fifty or so screenings turned into a process of watching the movie over and over again, asking myself why I did various things, and figuring out how it all fit together. A lot of great realizations came out of it — such as realizing that my mother — who ended up in the movie not because of me, but rather because my crew thought she was funny and helped lighten things up — ended up playing the role of the “every person” and being the entry point for most of the general public who had no immediate connection or driving interest in the issue. And at Tribeca, in a late night discussion, we realized that there are three voices in the movie, two of whom know exactly how the world works (knowledgeable evolutionists and cagey intelligent designers), and the third of whom, my mother, says she isn’t sure she understands anything about how the world works, says she’s reading the newspaper trying to figure it out, and eventually says, “I believe in all of it!” Guess which voice the general public most closely relates to (and in fact Mark Harris last week made reference to this in our discussion). Lots more revelations about the movie came out over the three years after the premiere. At first I was frustrated that I couldn’t find funding for a “next” movie. But in retrospect, I see that the most valuable part of the entire experience was not making the movie, but rather all of the showing and discussing of the movie. It’s about the importance of follow through. All of which is a rather long winded preamble to what I’m doing here today, which is in the same spirit of following through. Instead of moving on to “what’s next” for The Benshi, I’m taking a moment here to look back at last week and examine “what just happened.” I did this with the Marc Morano interview and it turned out to be the most important part of the process — to not only interview someone, but to then analyze the interview. For this exercise I’m using the chapters of my book as a structure for analyzing the things the two guys said. That was what we did in my acting class for the first few weeks. Getting into “acting mode” is pretty much the same as getting into “storytelling mode.” For great storytellers, when they slip into telling a story, you can see them drift into a mental space where they are every bit living in the moment of the story they are telling just as actors are living in the moment of the scene they are performing. Along the lines of the four organs theory in the book, Mark talked about how film as a medium is simply not very good with information (cerebral) — as he says, “It’s an emotional medium.” He talked about how he has produced books to accompany his documentary features because THAT is the more effective medium for all the facts and details — the sorts of “data” that makes scientists happy. He also talked about how burdensome exposition is in the telling of a story. Exposition is all the information that is needed to help the story make sense and be in context. A certain amount of it is essential and a lot of it is even good if delivered skillfully, but because it is basically information, it tends to “weigh” a lot and bogs down a story. As Mark said, it needs to be hidden. I asked him to take his mind back to the day he was captured by the Japanese after hiding out for several days on the Bataan Peninsula. I asked him how it felt — was he scared, what was he thinking of, was he intimidated by his captors. But what I got back was nothing more than information. Some people are great storytellers, able to put themselves back in the moment of the story, infusing their words with emotion and even humor. Not my Dad. As a storyteller he’d make a good brick layer. Yes, I know that sounds horrible. I love the old guy, but just not when he starts talking military history — he’s as analytical as the most detail-oriented scientist. I’ve come to the conclusion that this is the most important chapter and topic of my book, and Doug pretty much explains why, as he says, “Storytelling is the only language that can communicate with people all around the planet.” It is universal. More than 85% of the world’s population get their basic values through the telling of religious stories. Why would you not want to know how to tell a good story? Is storytelling only for fiction? Mark answers that with a resounding no — all of his non-fiction documentaries are major exercises in the telling of stories. It is his job to digest all the information on the subject, then “find the story.” As he says, he does this by discovering the core of the story, which is the source of tension or conflict, and in the case of a documentary, it’s the question that he is seeking to answer with the film. He identified the central question for both of his Oscar-winning feature documentaries. I had asked Mark if there are such things as “natural born storytellers.” He sort of side stepped the question by saying he wished it was easy to spot them for the sake of their admissions to film school. But Doug clearly exemplifies the idea of a natural born storyteller (I think) as he says he naturally used storytelling as a real estate salesman and finally realized it was the key element that made him successful, which led him into teaching his workshops. Neither of them talked about unlikeability, but Mark did discuss the reverse of this when he talked about casting and the simple fact that, “The camera loves some people.” When you move to Hollywood and start meeting actors you’ve seen on the screen you come to realize this. Many great actors are kind of shockingly unimpressive in person — diminutive, unimposing, and even dull. And many theater actors who have a huge persona on stage come off bland and uninteresting on camera. I don’t know that there is a science to this yet. Which is why filmmakers still do “screen tests” for actors. It’s not something you can gauge just by meeting an actor. It’s something for science and environmental organizations to keep in mind as they search for television and film spokespersons. There is an elusive chemistry to casting. And as Mark discussed, it is extremely important and every bit as much a part of a documentary as a narrative film. At the start of my film career I made a film about two brothers from Stonington, Maine who are lobster fishermen and incredible storytellers (which we’ll be showing in September at the University of Maine to celebrate the 20th anniversary of it). They exuded pure charisma on screen, but they were also the result of an extensive search we did, interviewing lobster fishermen along the coast of Maine. Lots of them were real characters, but none had the screen presence of the two brothers. Casting is crucial. And the final thing to say about both men is the best thing that makes them both wonderful storytellers is that they are immensely likeable. Both have a great sense of humor (loved Mark telling about how his first story as a news reporter was about having his car stolen) and have a warmth that allows them to tell deeply emotional stories. That’s what it’s about — using the human elements of humor and emotion to reach the broader audience.